Using natural acne cleansers is probably the most important step in your whole skin care routine. Finding a face cleanser that will clean acne prone skin properly without over drying or irritating your skin can be quite difficult. While a lot of these harsh cleansers will sometimes clear away your acne you are left with the side effects of tight, dry, sometimes burning damaged skin. The good news is that there is a natural and gentle way to get clear beautiful skin. Nature has once again provided everything you need to get rid of acne and prevent it from coming back. Before going any further about natural acne cleansers let's understand exactly how and why we get acne. Acne starts not on the surface of our skin but deeper inside hair follicles and pores. In these hair follicles are sebaceous glands which are what produce oil (or sebum) which lubricates our skin and hair. People with acne prone skin have sebaceous glands that produce more oil or sebum than normal. As all this oil makes it's way to the surface of the skin it carries with it dead cells which clog and plug up pores. Once these pores or hair follicles are plugged bacteria begins to form causing acne. Some big no no's when cleansing acne prone skin..
Never clean your face with soap! No matter what skin type you may have soap is bad, bad, bad. It does nothing except strip, dry, irritate and damage your skin. Do not use scrubs or anything gritty to clean your face. Scrubs irritate and cause inflammation. Never use washcloths, scrubbers or anything similar to cleanse your face. Finger tips are more than sufficient to gently clean your skin. Keep your hands off. Unless you're cleansing or moisturizing there is no need to touch your face. Picking and touching acne does nothing but make it worse and can cause permanent scarring. Do not allow skin to become over dry. This will only increase the production of sebum even more starting a vicious cycle. Your natural acne cleansers should restore your skin's ph balance, remove impurities and excess oil and nourish your skin at the same time. Always check ingredient labels to ensure that your acne cleanser is truly natural. The following are common ingredients found in acne cleansers that you need to stay away from. Benzoyl Peroxide Used a lot now in many acne cleansers. It commonly causes skin irritation, redness and inflammation which is exactly what anyone with acne prone skin is trying to avoid. Butyl, Propyl, Methyl and Ethyl Paraben All of these chemicals are used in just about all skin care products. They extend the shelf life of products and are very inexpensive. Dioxins Dioxins are often found in antibacterial products including acne cleansers. Synthetic Fragrances and Colors These two ingredients are most often what causes allergic reactions and skin irritations making them less than ideal for acne prone skin. Sodium Lauryl Sulfate, Sodium Laureth Sulfate These ingredients are found in foaming cleansers and terrible for anyone's skin. These chemicals can cause inflammation and can weaken the immune system. Alcohol Any skin care that has alcohol in it is never a good idea to use. Below are common ingredients found in nature that are proven to clean your skin gently and keep acne under control. Baking Soda is an excellent exfoliant for acne prone skin. It removes dead skin cells and unclogs pores. It can be used alone in a paste or you can add to your favorite cleanser. Always massage very gently in to the skin to prevent any damage. Oatmeal draws toxins out of your skin and absorbs excess oil. It also has a very soothing effect. Apple Cider Vinegar is very helpful in clearing acne. It kills bacteria, absorbs excess oil and draws out toxins. Egg whites are good for healing and rebuilding acne prone skin. Tea Tree Oil is a natural antiseptic that has antiviral, antibacterial and antifungal properties. It inhibits the growth of bacteria and reduces redness and is one of the quicker ways of getting rid of acne. Aloe Vera has very strong healing properties. It not only heals but it can prevent scarring and fade acne spots. Cucumber is an antioxident that has a soothing calming effect on skin. Honey is an ingredient used for many skin conditions. Honey has antibacterial properties and also heals and moisturizes. Evening Primrose is rich in fatty acids and helps inhibit bacterial growth. It also reduces inflammation and is very soothing. The following are more essential oils known to be very effective when treating acne. Look for these natural ingredients in your acne cleansers or use them in your own recipes. They are proven acne fighters that will not damage your skin, but will help make it healthy and clear! Always rinse face with warm water. Hot water damages skin and cold water causes your pores to close up. Always pat your skin dry. Never scrub. Be sure the towel you use is clean. Always change your pillow case regularly. Our faces spend a lot of time on our pillows when you think about it, so keeping it clean is important. If you really want to know exactly which ingredients are in your acne treatments a good option is to try making your own. That way you are in full control over what ingredients go on your skin. Unfortunatly time can be a factor so if you are going to buy your acne products I would recommend checking out ZENMED products. 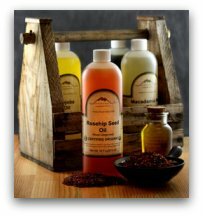 You get a completely customized natural skin care system that works and is inexpensive. It also comes with a 60 day money back guarantee making it a pretty risk free purchase. I am sure though if you try ZENMED you will not be wanting your money back. If you've tried everything else with out results you will be pleasantly surprised by these products. For more information on ZENMED acne products click here. Whether you decide to purchase or make your own acne cleansers, if you follow these guidelines and use only natural ingredients you will be well on your way to clear healthy skin.